The show starts off with a video montage honoring Martin Luther King. Roman Reigns heads out to the ring after the show credits. We see the shark cage that Chris Jericho will be locked inside of and hung above the ring at the Royal Rumble when Roman Reigns faces Kevin Owens for the WWE Universal Championship. Reigns says as a former member of the Shield, he cannot complain about being outnumbered. However, at the Rumble, Owens will be with him one-on-one and how no one can beat him in that situation, Owens included. Reigns talks about walking into WrestleMania as the Universal Champion but Paul Heyman comes out to interrupt. Heyman tells us that Brock Lesnar is here tonight for the first time since Survivor Series but the crowd greets him with “Goldberg” chants. Heyman lets the crowd get the chant out of their system before reminded them how Goldberg is not here tonight. He then gives us a Rumble preview which is “eat, sleep, elimination, repeat.” Reigns then says that Lesnar must be somewhere eating or sleeping because he is not with him but Owens & Jericho are now out to interrupt. They talk about both being the Universal and United States Champions before telling them no matter the scenario, they will still be the Universal Champion when WrestleMania ends. Owens tells Reigns he will still be the Universal Champion and even hold the belt once WrestleMania is over, no matter is opponent as Jericho stares him down. Seth Rollins comes out and says his ears are burning up because you cannot have the WrestleMania main event without “Seth Frickin’ Rollins” in the discussion. Rollins reminds everyone that anything can happen in the WrestleMania main event but Braun Strowman comes down to the ring to stare down Reigns but Lesnar comes out. He slowly heads to the ring but Sami Zayn comes from the crowd and jumps on Strowman’s back as a brawl breaks out. We are left with Lesnar and Zayn in the ring as Lesnar smiles before hitting him with a German suplex. Strowman stares down Lesnar from the apron but jumps down as Reigns hits Lesnar with the Superman Punch. Reigns then knocks Jericho off of the ropes but ends up walking into an F5 after that with Cole hyping up the Rumble match. This started off really rough as Reigns did a really poor job on the mic and Heyman’s act is getting tiresome. Rollins also continues to struggle in his role as one of the top babyfaces on RAW. However, things got interesting once things broke down and we got some teases for what could happen in the Royal Rumble match. They’ve at least done a good job of putting over the competitors in the match. I love how Zayn remained fearless, even while stuck in the ring with Lesnar and having Lesnar vs. Strowman in the Rumble, with Strowman a much better worker than he was last year, should be a fun segment if it occurs. I also like how Jericho shot Owens a look when Owens said he would walk out of WrestleMania the Universal Champion, no matter the circumstances. The Rumble should be a key part of the Owens/Jericho storyline. Enzo hammers away on Mahal but gets shoved down. He boots Mahal down then tags out as they eventually clear the ring as we head to commercial. We return as Enzo is working over Mahal. Rusev makes a blind tag and plants Enzo with an uranage as that gets two . The crowd rallies behind Enzo as Mahal tags in and hits a knee drop. Rusev is back in and works a bearhug but eats boot on a charge in the corner then Enzo hits a DDT as both men are down. The crowd is behind Enzo, who makes the tag as Cass runs wild on Mahal. He gets two off the Empire Elbow as Rusev breaks up the pin. Cass then boots Rusev off of the apron but Mahal sneaks a rollup for two. Cass then bots Mahal down and tags Enzo as they hit the Bada Boom Shakalaka (8:35) *1/2. Thoughts: Sloppy match but the crowd was really hot for Enzo & Cass. Mahal ate the pin which makes sense but the Cass and Rusev feud seems like it will continue. This feud is not doing much for me, personally. Jack Gallagher is all dressed up with his umbrella walking slowly backstage as he will be on commentary for the next match. Daivari beats on Dorado in the corner to start. Dorado comes back with a springboard crossbody for two but Daivari beats him down once again. He yells at Gallagher but that allows Dorado to make a comeback. Dorado hits a back handspring into a stunner as that gets two. Dorado hits a missile dropkick then heads back up top but misses a crossbody then Daivari hits a clothesline before applying the cobra clutch for the win (2:12) *. Thoughts: Gallagher was good on commentary as he put down Daivari for being arrogant. However, Daivari is incredibly bland and generic and its almost baffling there is no one else they could fine to put in his role. Dorado hit a few nice moves but seems to be on the bottom of the Cruiserweight totem pole. Replay of last week on RAW when the Undertaker declared himself as part of the Royal Rumble match. We get to see some highlights from the WWE UK Championship Tournament from this past weekend. A really fun tournament that you should watch. 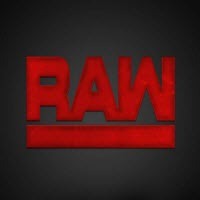 Now, we are shown footage of Sasha Banks working out in the ring before the show when Nia Jax attacks her from behind as Graves tells us that Jax blames Sasha for why she is not the #1 Contender to the RAW Women’s Title. The setup was a little too contrived but they got over why Jax attacked Sasha and it continues their feud. Cole alerts us that Cesaro & Sheamus are both going to be part of the Royal Rumble match. Cesaro and Anderson mix it up to start. Cesaro catches Anderson with a tilt-a-whirl backbreaker as the champs neutralize Anderson for a bit. Cesaro misses a charge in the corner as Anderson & Gallows work him over in the corner. They get two off of a backbreaker/elbow drop combo then go back to cutting the ring in half. Anderson prevents Cesaro from tagging out as Cole wants to know if competing in the Rumble match will hurt the friendship of Cesaro & Sheamus. Cesaro is able to break free and tag out as Sheamus runs wild on Gallows. He gets a nearfall with a flying clothesline then hits his apron forearm smashes as Cesaro cuts off Anderson and tries to put him in the swing. The ref orders Cesaro back to the apron then Anderson runs over and chop blocks Sheamus, who eventually gets knocked to the floor as we head to break. The action returns with Gallows hitting Sheamus with a corner splash. Gallows then tries to knock Cesaro off of the apron and charges at Sheamus but gets caught with a powerslam. The fans rally behind Sheamus as he makes the tag. Cesaro runs wild on Anderson and gets two with a dropkick. Gallows runs in to break up the swing but Cesaro sends him outside. He then hits Anderson with the Swiss-1-9 before flying out to hit Gallows with a plancha. Back inside, Cesaro gets a nearfall with a springboard corkscrew uppercut. Cesaro then successfully puts Anderson in the swing. He rolls through with a Sharpshooter but Gallows runs in to kick him in the face. Anderson covers but only gets two as the fans are really into the match. Anderson hits a spinebuster for two as Sheamus breaks up the cover. Sheamus accidentally kicks the ref then gets laid out as Anderson & Gallows hit Cesaro with the Magic Killer. The referee is out so another ref runs in and counts as Anderson & Gallows get the win. However, the refs argue and the official word is that Sheamus was disqualified for hitting the officials (12:59) ***1/4. Thoughts: I really liked the match. However, the finish was odd and screwing the heels out of the titles is not exactly a common occurrence. Seems like this feud will continue and with matches like this I have no problem seeing them wrestle again. A video package tribute for Jimmy Snuka airs. It features comments from several wrestlers from past and present. After it ends, we are shown tweets from wrestlers mentioning Snuka’s passing. Tonight, we will get Roman Reigns & Seth Rollins & Sami Zayn vs. Kevin Owens & Chris Jericho & Braun Strowman. Emmalina will be premiering soon. Sami Zayn is in the locker room talking strategy with Rollins & Reigns. He is quite excited and comes off very awkward then tries to do the Shield fist bump but the others walk out on him. Weird segment that made Zayn look like a complete goof. Tony Nese vs. Rich Swann is about to take place but Neville comes out from the crowd and beats down Swann. Neville finally lets go and looks at the crowd but Swann fights back. Swann yells at the ref while being restrained then Nese attacks Swann. Neville tells Nese to stop so he does but goes back to punching away. Neville then tosses Nese outside and ends up hitting Swann with a super kick. The story here is that Neville wants Swann all for himself. Neville’s heel character is really great at the moment and Swann showed some fire here too. Back from break, Neville is walking backstage and asked why he attacked Swann. Neville then calls the interviewer ( I did not catch his name) and all of America “hypocrites” before telling us Swann cannot beat him at after their match at the Royal Rumble, Swann will kneel before him with the Championship as he is the King of the Cruiserweights. This new interviewer was very poor at his job. The New Day head out to the ring. Xavier talks about how stacked the Royal Rumble match is as Kofi names off the top competitors. They now talk about how the match is every man for himself and if one of them win the Royal Rumble then they all have won and can main event WrestleMania. However, Titus O’Neill interrupts and says how he does not even want to be in the New Day because he wants to replace them. Titus then wants them to hook him up with a rumble spot then when he got laughed at said he will take them as he issues a challenge. Kofi makes a joke about how if Titus knew how to call timeout then he’d still be playing football a Big E accepts the challenge. Titus ends with a “Titus Rocks” chant. The Titus vs. New Day feud continues. The match started during the break. Titus beats on Big E in the corner but runs into a shoulder tackle. Big E toys with Titus then locks on an abdominal stretch. He gets two with a back elbow smash then beats on Titus outside of the ring. Titus shoves down Xavier then runs in and catches Big E with a boot to the face. Titus beats Big E down then gets two with a clothesline that was not even close to making contact. Titus gets another nearfall with a Dominator then applies a chinlock. Big E escapes but gets caught with a slam. Titus mocks Big E then hits a leg drop but that only gets two. Titus continues to mock Big E, who begins to make his comeback. Big E gyrates over Titus before hitting a splash then hits the Big Ending for the win (4:34) 1/2*. Thoughts: Although he has some charisma, Titus is just plain awful once the bell rings. After several years on the main roster he has shown minimal improvement. This was really ugly at times. Charlotte Flair heads to the ring. She talks about how despite her genetic superiority, she achieved her success due to being the hardest worker. Charlotte said that Bayley is the definition of average, just like the WWE Universe and she makes them go crazy because she is just like us. We are then shown Bayley in pictures with various WWE wrestlers like Ivory, Rob Van Dam, and Bret Hart. After that, Charlotte shows us a poem written by Bayley as she warns us what is put on the internet lasts forever and while Bayley was doing that she was training all day to become a National volleyball player. We then get footage of Bayley reading a poem she wrote about becoming a pro wrestler as Charlotte mocks this before taking out a copy of that poem to read herself. Charlotte reads a bit of this before telling Bayley she will not beat a “franchise player” such as herself. Bayley then comes out and is angry. Charlotte ducks out and stands in the aisle as Bayley asks why she is bringing up old photos. Charlotte tells her this is who she is, an average fan, as Bayley is not ashamed of her passion for the WWE. Bayley then talks about not having a dad who got her into the WWE with just one call but did have a dad who bought her a ticket to every WWE show in San Jose, even if he could not afford to do so, and told him one day she would be in the ring. Tremendous heel work by Charlotte here. Bayley still struggles with her promos but displayed passion here and got the crowd behind her as this was an effective segment to further along their feud. Owens & Jericho approach Strowman backstage to talk strategy. They both try to talk Strowman into destroying Reigns & Rollins but Strowman says they do not understand he does what he wants, when he wants, and will not only win the Rumble match but also the main event at WrestleMania. Strowman then tells both men he will destroy Reigns, Rollins, and Zayn tonight. We are shown how the relationship between Alexander and Fox ended last week on “205 Live.” Kendrick cheap shots Alexander after a break in the corner. Alexander comes back with a headscissors then a dropkick before flying out with an Arabian Press. Back inside, Kendrick comes back with a leg lariat then he chokes out Alexander on the middle rope. Alexander breaks out of a full nelson as we see Noam Dar watching the match from the locker room. Alexander hits a few boots to the face then drills Kendrick with a back elbow smash. Alexander gets two with a springboard clothesline then tries for a back suplex but Kendrick rolls through and puts on the Captain’s Hook. Alicia Fox comes out and pushes the ropes to him. Alexander rolls outside but wants Fox to get away as that allows Kendrick time to kick him down. Kendrick tells Fox “beat it, toots” before heading back inside. Kendrick tries again for the Captain’s Hook but Alexander rolls through and hits the Lumbar Check for the win (5:00) **. After the match, Fox comes into the ring but Alexander blows her off and leaves. Thoughts: The match was fine but the storyline between Alexander and Fox is just terrible and not doing Alexander any favors at all. He is far too talented to get mired down with this stuff. Jax is asked about her attack on Sasha. Jax calls Sasha a wannabe and her aura is over. Jax promises people will see the truth and that Sasha herself knows its over for her, because she saw the look in her eyes. Not the best promo I’ve ever heard. Kurt Angle is announced as the first entrant of the WWE Hall of Fame Class of 2017. This starts off in a brawl as its down to just Reigns and Strowman. Strowman tosses Reigns over the top rope then we head to break. The action returns with Reigns getting worked over in the corner as Cole tells us the match officially began during the commercial break. Jericho slaps Reigns a few times but gets decked then Zayn tags and chops Jericho. He gets two with a standing moonsault but Jericho is able to make the tag. Owens hits Zayn with an enziguiri after using a chinlock as that gets two. Jericho tags in and roughs up Zayn for a bit. Zayn almost tags out but Owens tags. Owens mocks Zayn but gets kneed in the face and Reigns tags in and runs wild on Owens. Jericho grabs Reigns leg from the floor and that prompts Rollins to run over and attack him. 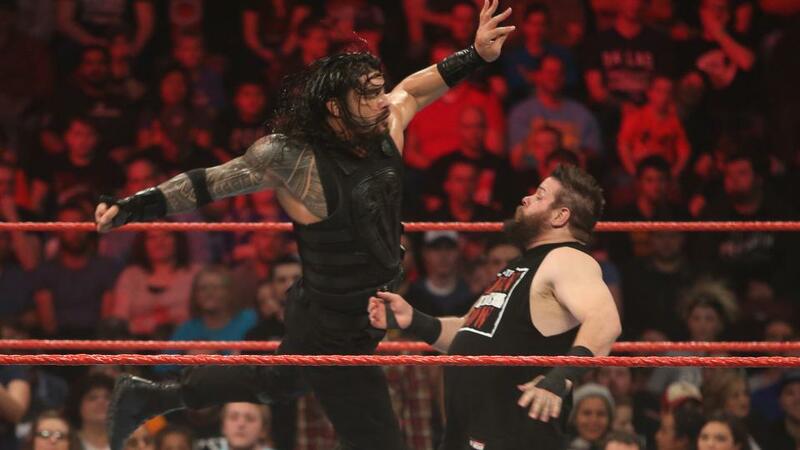 Strowman then pounces Rollins and even blocks a Superman Punch as Owens drills Reigns with a super kick for two as we head to another commercial. We return with another giant brawl in the ring. Owens puts Reigns in a chinlock as the crowd rallies behind Reigns. Owens gets caught with a Samoan Drop then both men tag out as Rollins runs wild on Jericho. Zayn helps clear Owens from the ring then flies out to hit Owens with a tope con hilo as Rollins wipes out Jericho with a tope. Zayn ducks a charging Strowman, who clotheslines the post, as Rollins almost puts Jericho away with a springboard knee drop. Jericho counters a pedigree and tags Strowman, who tries to chokeslam Rollins but Zayn makes the save. Strowman beats down Rollins and Zayn but they fight back and Zayn tags in to hit Strowman with a crossbody for two after Rollins wipes out Owens & Jericho with a plancha. Zayn tries for the Helluva kick but Strowman hits a clothesline then puts him away with a running powerslam (17:00) ***1/2. After the match, Strowman carries Zayn to the announcers table but Rollins runs up to hit him with a chair then Reigns hits a spear. Reigns & Rollins clear off the table but Owens & Jericho run out for the attack. They set up Reigns for a table attack but Rollins makes the save. Rollins hits Jericho with a Pedigree on the ramp then Owens takes out Reigns & Rollins with a chair. He drags Reigns over to the table then puts him through it with a powerbomb as the show ends with Owens standing over Reigns. Thoughts: Really fun match with a lot of energy. Everyone involved did a great job. The post-match brawl was effective too. I liked that a lot, actually. Strowman got the win and still looks like a monster while the Reigns & Rollins vs. Owens & Jericho feud played out nicely at the end. Final Thoughts: Overall, this was a pretty good show. They really have hyped up the starpower in the Rumble match and did a good job with the Bayley/Charlotte feud too. Sure, there were some stinkers but that was mostly filler and lower card feuds. The RAW matches at the Royal Rumble PPV were built up quite well tonight I thought and hopefully they can build off of this and create some intrigue heading into WrestleMania.